Shirley Arlene Brown a lifelong resident and Town Clerk and Treasurer of the community for many years, passed away on Wednesday, February 1, 2017, at her home surrounded by her loving family. Shirley was born on December 10, 1934, in Belvidere, the daughter of the late Maurice Ezra and Hersa Lovisa (Eldred) Eldred. Shirley was 82 years old. On September 3, 1955, in Belvidere, she married Larry Lee Brown, Sr. who predeceased her on April 4, 2001. Shirley was educated in Belvidere and graduated from Cambridge High School in 1953. She then began a long career of serving her community. In 1961 she became Assistant Town Clerk and Treasurer, serving 24 years. In 1985 she was elected Belvidere Town Clerk and Treasurer, a position she held at the time of her passing. She also was a member of the Belvidere Town Planning Commission, Cemetery Association and Community Club. 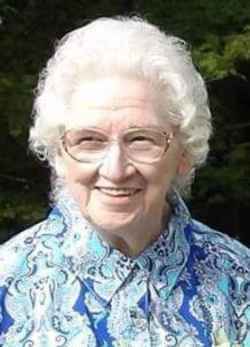 She was a lifelong member of the Belvidere Community Church. When she wasn’t giving back to her community, she enjoyed spending time with her family, especially her grandchildren, as well as listening to Bluegrass music and tending to her gardens. Shirley is survived by her children, Emily and Tim Lapan, Larry Brown and Jeanette Ward, Juanita Brown, Neal and Meg Brown, Laureen and Bernard Allen and Stephen and Karen Brown. She is also survived by 14 grandchildren, 13 great-grandchildren, sister, Greeta Talamo, sister-in-law, Leona Eldred, brother-in-law, Earl Domina, Sr. and brother-in-law and sister-in-law, Curtis and Lucille Brown and many nieces, nephews and cousins. In addition to her parents and husband Larry, Shirley was predeceased by her twin daughters Eliza Holly and Holly Beth Brown in 1964; her siblings and their spouses Leoda and Ray Barry, Jr., Kermit, Sr. and Beverly Eldred, Maurice, Jr. and Lydia Eldred, Joycelyn and Kenneth Adams, Sr., Ethelyn Domina and Emmett Eldred. Shirley also was predeceased by Larry’s siblings Louella Bessette, Wilbur Brown, Mary Tallman, Amsden Brown, Sylvia Brown, Betty Ashline and Carroll Brown. Relatives and friends are invited to attend calling hours on Monday February, 6, 2017, from 4:00 to 8:00 PM at the Heald Funeral Home, 87 South Main Street, St. Albans. A funeral service will be held on Tuesday February 7, 2017 at 1:00 PM at the Mountain View Tabernacle, 5911 VT Route 109, Belvidere Center with Pastor Lorenda Dunham officiating. Interment will be later this spring in the family lot in the Belvidere Cemetery. Memorial contributions may be made in Shirley’s name to the Belvidere Cemetery Association, c/o Treasurer, 3958 VT Route 109, Belvidere, VT 05442 or the Belvidere Community Church, c/o Julie Machia – Treasurer, 115 VT Route 109, Belvidere, VT 05442. Assisting the Brown family is Lucien J. Hayes of the Heald Funeral Home, where an on-line guest book is available at www.healdfuneralhome.com.